This blog post is a little overdue! There are a couple of reasons for that, but the main one is that my computer is dead, and my charger won't work with my converter. Therefore, this post is brought to you via my phone. Technology is actually terrible. But this post is important, because last week, I fulfilled a lifelong goal. I've dreamed of doing this for as long as I can remember, and it's one of the most incredible things I've done on this trip so far. 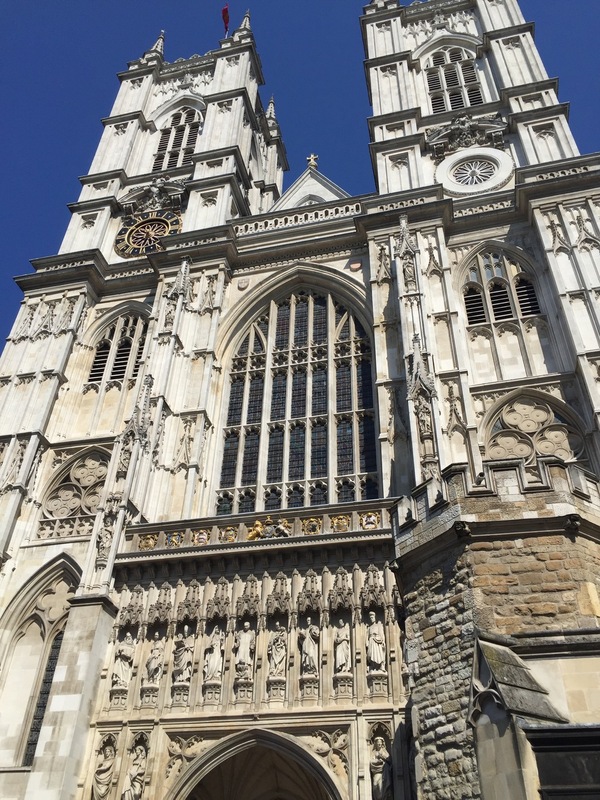 I went to Westminister Abbey. Last Thursday we took a day trip to London to see the Imperial War Museum. We boarded a bus that took us to the capital, and we disembarked in the posh part of London across from a building fronted by two large guns. The Imperial War Museum has several exhibits on that are related to the two World Wars. We were there for the World War I exhibit, given the CASI theme for the year. The exhibit was beautifully laid out. It featured artifacts from the war, posters, lots of information, recordings and video, interactive maps -- you name it; they had it. At one point, you had to walk through a reconstruction of a trench while audio of scattershot and dripping water played. It was chilling and utterly moving. One thing I've noticed since being here and studying this horrific war is that I actually don't know much about it. The Americans were definitely involved, but we only entered the war in 1917. We study it, but for us, World War II is the big one. It's our great international conflict. I've found that I don't realize the absolute trauma and incredible impact that the Great War had for the participants. It was graphic, it was terrible, and it tore the world apart until it was hanging on by a thread. All this history, by the way, helps me to get into my music more. I have more insight into it. I feel some share of their grief. I feel the weight of this matter and this history. Through music, I get to share in this heavy part of history. I get to share in part of a culture. I'm so honored to be able to experience even a smidgen of history through my music. After the museum, I and some friends who had brought our lunches ate quickly in Trafalgar Square. We had a few free hours to see the nearby attractions, and my friend KaLee (who is also obsessed with Julie Andrews) was dying to see Buckingham Palace. So we followed the Silver Jubilee Walk down to the Palace. Y'all, it's amazing in real life. It's massive and so, so grand. The Queen was even in residence -- you can tell by whether or not the Union Jack is flying atop the palace roof. Many people were gathered for a garden party -- there were lots of fancy hats. After taking my Guns Up picture (Wreck 'em, Tech), I desperately wanted to see the Abbey. So we walked over, along St. James' Park. I felt very fine indeed. Let me tell you something you may already know about me. I am intense about old churches and cathedrals. I revere them. This is a monument to God's majesty and goodness and grace and all that He is. Cathedrals are the builders' and architects' way of glorifying God. Christian churches are sacred to my heart (as I believe they should be). And as I've said, I've been wanting to come to Westminster all my life. I don't think anything prepared me for this. Unfortunately, you aren't allowed to take pictures inside, but I actually really appreciate that. With that rule in place, I am free to enjoy it, instead of feeling that I have to document it. I am free to worship God while I walk through this glorious place. For it is glorious indeed. I fear that words will escape me. They do. How do you describe something like this? Every half hour, a woman's voice comes on the PA and invites all the guests to pray with her. So I prayed in Westminster Abbey. Twice. I saw the graves of Queens Elizabeth I (one of my favorite historical figures) and Bloody Mary. I saw stained glass like you wouldn't believe. The Abbey and church are still kept up by Benedictine monks. Endless historical figures are memorialized there, including composers Edward Elgar, Ralph Vaughan Williams, and G.F. Handel. My three friends and I were walking around in a waking dream, always murmuring, "Best. Day. Ever." After the Abbey, we walked back to the bus and rode back to Oxford. The return trip took twice as long as the initial trip, because traffic out of London was terrible. On the way home, everyone got to see how I sleep on buses with my mouth hanging wide open. So that was great for me. The next day was full of concert preparation -- we had the first concert on Friday! It was also the last day in Oxford, so we filled our spare time with running around town. That morning, Greg gave us a lecture on the way the landscape influences English imagination and art. I honestly don't think I've ever been so inspired in my life. I read something in a Lewis book once -- I think it was Surprised By Joy -- in which he makes a comment on the way the Englishman loves nature. It left an imprint on my heart, obviously, but I understood it better after Greg's lecture. I heard names of lands I've never been to, but instantly loved, because of the connection to my favorite authors. Some of these artists and writers and composers who went to the war were only kept sane by the memory of their land, their England. One of them literally stayed sane by reciting the names of English counties and cities. Greg shared some beautiful pieces of music with us, one of which I'm listening to right now: Herbert Howells' piano quartet in A minor. I love strings. I think this lecture spoke so deeply to me because I love nature so well myself. I feel an attachment to the West Texas farmland because that land is the livelihood of my family. And as I've shared before, I feel alive when I go outside. There's something about it that rests my soul and reminds me of the heart of God. That night, as I said, we had our concert. I'm singing well. I still have a lot of improvements to make, but it's a process, and I'm trying to trust the Lord in the process. I keep reminding myself that the process is the adventure, and that God can be trusted. All this is to say that the concert went well (I received some very sweet compliments), and God will see me through the rest of the improvements I need to make. The next day, Saturday, we rose bright and early to take the train to our next stop, Falmouth. This journey took most of the day and involved sprinting through train stations, all with Paddington Bear tucked under my arm because I didn't want to squish him in my backpack. Later I will share with you about Cornwall. I'm absolutely loving it here -- we never want to leave! But now a book is calling me, and sleep, too. Plus, I don't want to spoil the beauty with an everlong post. So stay tuned! You'll love this. Bonus photo: the Malvern hills Greg told us about. Don't they just call to you?